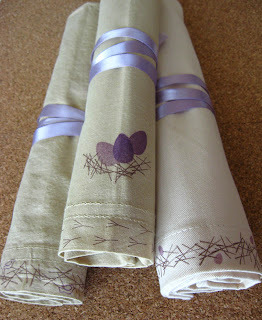 Schlosser Designs: Tutorial Tuesday - Stamped Spring Napkins! These were super simple to do! I used the stamps from the Have A Tweet Day stamp set. These are cotton napkins I found for $1 a piece at Garden Ridge. 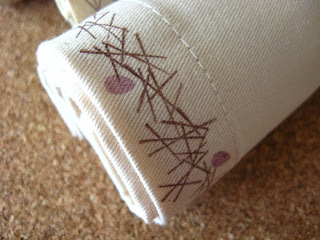 Just pull out your ink and stamp directly onto the napkins! It's easy using the clear stamps because you can see exactly where the image is going, and you can make sure that you have ink covering the entire image before you stamp. Use a permanent ink like Stewart Superior's Hybrid ink. Heat set it with your iron without using steam and you're ready to go for a wonderful Easter brunch! 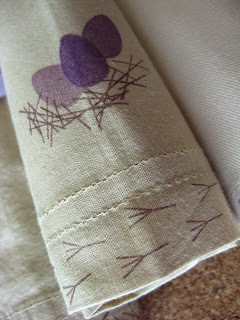 I love the little bird feet border on this one! And a little nest garland with occasional eggs! Those are adorable. You'd have been so proud of me. At Bunco Night I stamped the corner of the paper napkins with a dot stamp to look like different sides of the dice. Those are so adorable, and I love the ink colors you chose! I'm on my way to find some of those clear stamps, thanks for the reference! What a great idea! I'll be linking to this in my next spring roundup, thanks for sharing! That is awesome! I would love to get more into stamping but when I have tried to stamp it always seems to turn out yucky. I need help in that department! But those napkins are so fun! Have a great day! And I will be coming back often!